As you may or may not know, I love coating meats in mayonnaise and adding a little crunch before baking it in the oven. It's sort of my thing. 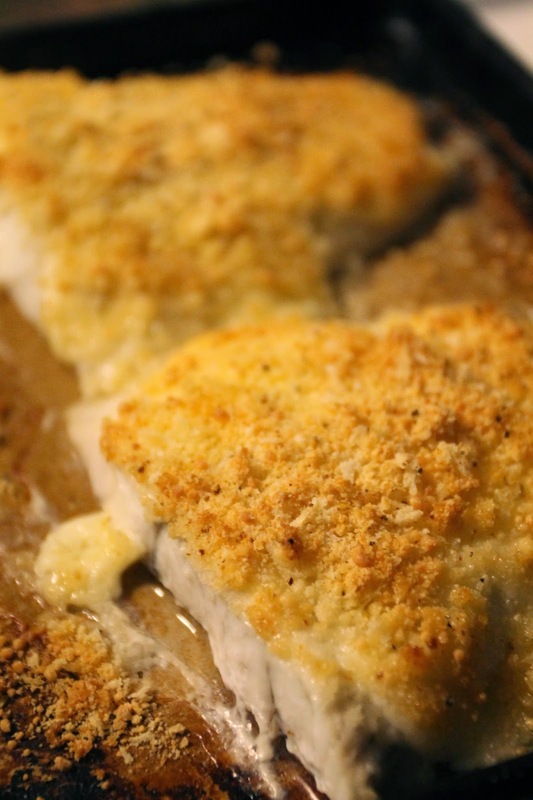 So when my mother-in-law came to cook for us when my daughter was born and she made this fish recipe, I was HOOKED! This is super easy and healthier than the chicken and pork counterparts. Barramundi is a sustainable swordfish, so it's a good and meaty. We buy this fish in the freezer section at BJs, and they are frozen individually, which makes this an easy weeknight meal. Did I mention that it cooks in the oven in 15 minutes?! Yes, I know. And I know that I say "if I can do it anyone can," but this goes double now...it's like, if I can do it with a baby strapped to my chest, so can you! So, get your kitchen confidence ready and let's cook!! Two purdy pieces of fish ready to be dressed up and baked! Is there such a thing as too much mayonnaise? I think not, and this picture proves it. In reality it's just a teaspoon (okay a heavy teaspoon) each. Equal parts panko bread crumbs and parmesan cheese mixed in a mason jar and poured on top! Baked in the oven for 15 minutes on 400 degrees. Dinner is served. I made some green beans and potatoes to go along with my fish and this was, in my opinion, the perfect meal! It's so easy. Place your fish on a baking sheet (I used a stone for easy removal once baked). Top the fish with the mayo and then the panko/parmesan mixture. Serve with green beans and potatoes or a nice crisp salad! YUM!